As I travel around the country, I stop at all the usual touristy spots. With geocaching, I stop at all the out of the way, weird and wonderful places there are to see that rarely get any attention at all. Even if you don't bother to find the cache or sign the log, you're still going to have fun investigating these little known places. Geocaching.com and downloading the app will get you going. These geese were clustered in one spot in the early morning light on Willapa Bay. I never would have found them had I not braved the mosquitos and walked the trail that rarely sees any feet. Actually, I RAN the trail and won the mosquito race!! HA!!! There's another world out there beyond the little town of Chinook. Who knew there were so many fields of cattle roaming around with pretty rivers everywhere!! I even found the USS Plainview anchored in the mud of the Columbia River. In 1960 the U.S. Navy commissioned a hydrofoil research ship, capable of speeds up to 90 knots, to explore the possibility of such a speedy ship for anti-submarine warfare. Unfortunately, due to budget cuts, it was abandoned in 1978. Eventually she was sold to a private party for $128,000 with the understanding it would become a fishing boat. That never happened, and now she sits on a mud bar across from Astoria. I have an idea you already know what THIS is!! I saw LOTS of it on the peninsula this year!! Just watch where you step. Ever wonder where all the old junk cars go? 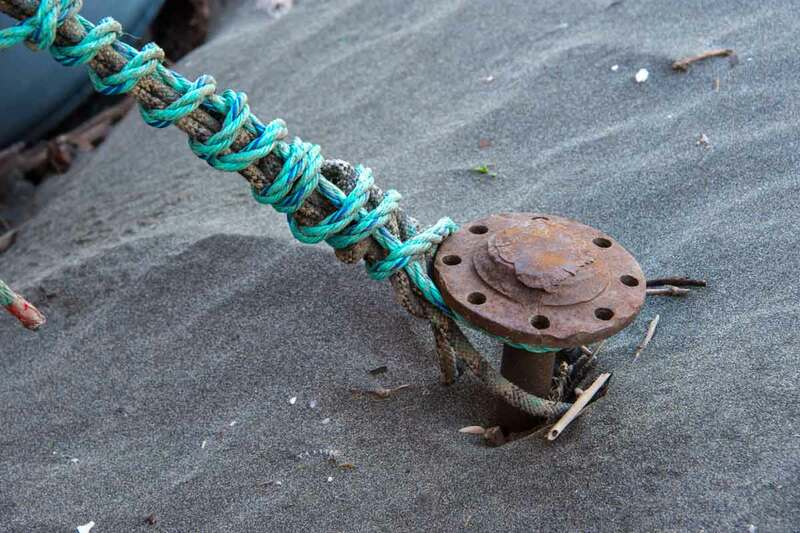 On one geocaching foray around Chinook, I found not only the local scrap dealer but a beautiful long bayside road, virtually free of traffic and people. What a neat spot to spend the day. You never know what you'll run in to as you wander around the country roads looking for caches. It happened on this day I saw a garage sale sign. Normally I pass them right by. THIS time I was just curious what they would be selling this far out in the boon tullies ... I mean WAY out. 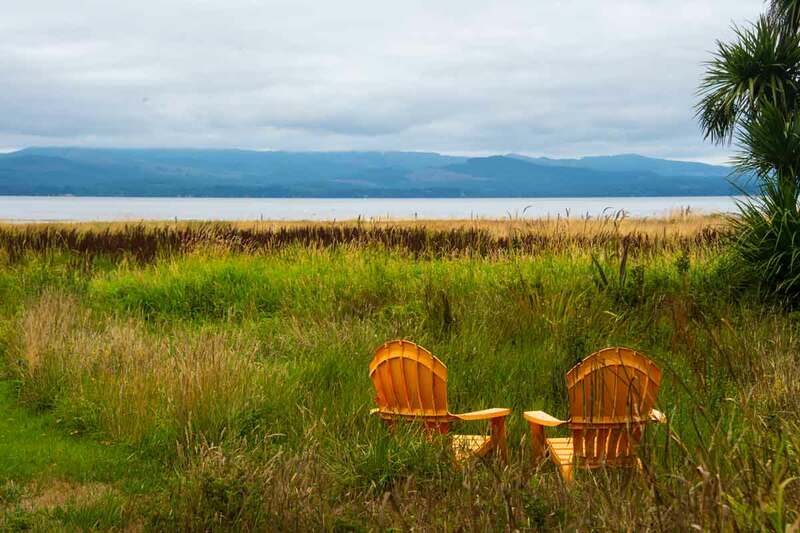 There sat a mobile home with the most gorgeous view of Willapa Bay, and two little old people selling their stuff. It was mostly glassware, but way in the back I spotted this chair, along with a beautiful television cabinet for $25. Had I been able to get it in my Jeep, I would have had both. The chair was a steal at $12 and it came home with me!! 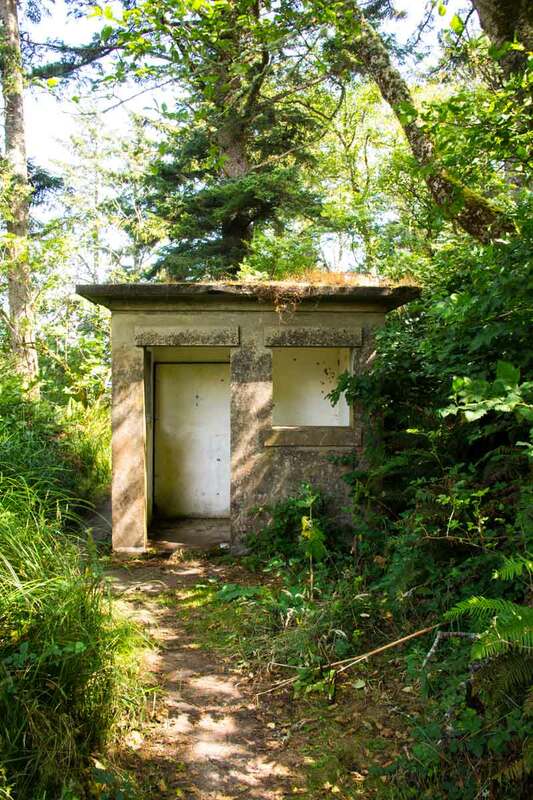 Just around the corner from the Cape Disappointment Lighthouse is the Harvey Allen Battery, built in 1904 as part of the military's harbor defense of the Columbia river. It is open to the public at no charge. As you wander through one of the concrete buildings, you will find photos like this one, showing what it looked like back in the day. 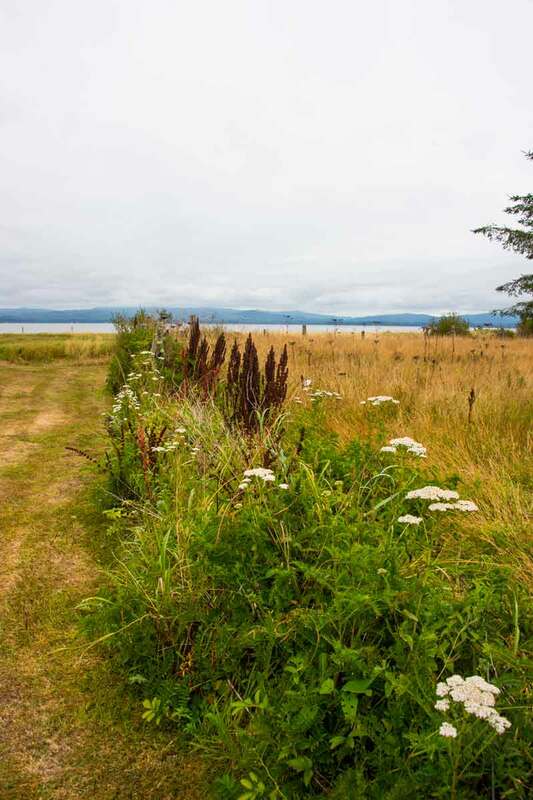 Here's what it looks like today, with the Lewis and Clark Interpretive Center built directly behind it. The building pretty much blocks the view the battery had. Personally, I think the battery was much more interesting than the Interpretive Center, which costs $5.00 to enter. Most of the battery is open so you can wander in and out along the dark passages, getting the feel of what it might have been like to be stationed here. One of the paintings inside still exists, thanks to the plexiglass covering. 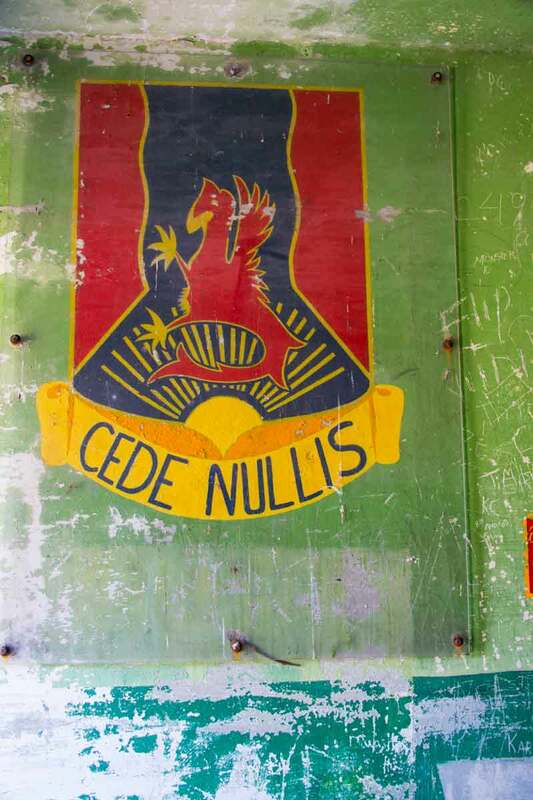 Cede Nullis ... Yield To None. There are a few other outbuildings that look like guard houses. This particular one was probably the latrine. There's a cache out there somewhere ... the hint said fern near bunker. Let me tell you, there are a million ferns here, along with lots of berry bushes to bite you on the arms while you are looking. After sneaking around for thirty minutes, I gave up and headed up the trail. There it was, under the FERN. I can't say this isn't frustrating sometimes!! But oh the elation when you FIND IT!! 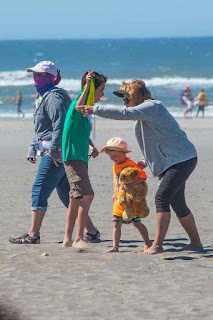 While there, I got caught by a Mom and had to explain what I was doing. She was so excited ... her two young daughters just had a pirate birthday party with a treasure hunt. This was right up their alley and they would learn lots of history as a side benefit. She downloaded the App. YAY!!! Two new converts!! By the way, the Scanner app I use is 5-0 Radio Scanner, along with Where Am I, another app that gives me the required County information. It also gives you GPS coordinates if you get lost. Today I'm on the hunt for some wind. Unlike Long Beach, so far there's not a breeze to be had!! 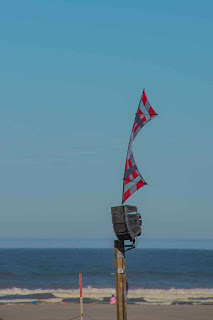 Not the kind of beautiful sirens you hope to see by the sea. This was the kind that wakes you up at 11:59 and scares you to death. Not me ... this time anyway ... but it scared my neighbor in Long Beach so much he had already jumped in his truck to hook up his trailer. He was sure it was a tsunami warning and he was getting out of dodge. Having heard the same siren the day before, I was pretty sure it was the Volunteer Fire Department call to arms. To double check, I turned on the scanner on my phone. If you don't have this app, it can not only be rather entertaining at times, but it can ease your mind ... like it did mine ... that there was a house fire on Willow Street, not a tsunami. Still, it was a rude way to wake up!! 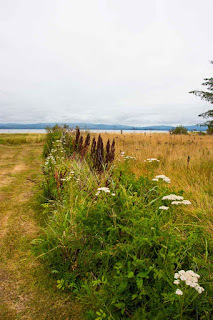 Back in the fabulous little town of Oysterville, here's a few more scenes you might see if you took a walk around town. All of these images have been taken from the grass covered side streets. 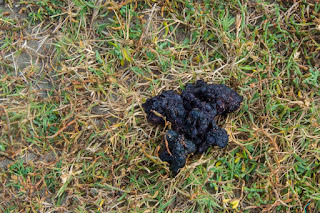 This was right next to the $600,000 house for sale. You can read the signs in front of the houses which supposedly give you a short history. One of the locals said those signs may be more fantasy than truth. It doesn't really matter. The houses are beautiful! 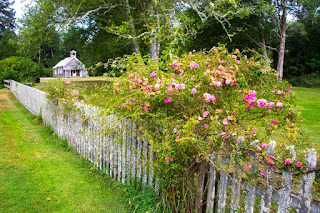 This is the rose bush at the corner of the school yard. That's the old schoolhouse in the background, which today houses Girl Scout meetings. You can probably see why this is perfect bear country. Lots of dandelions and grass to eat. Totally unrelated, I had heard about Waikiki Beach near Ilwaco several times. In fact, they have music presentations there. It took me awhile to figure out exactly WHERE it was. You will need that Discovery Pass, but it's worth the cost. 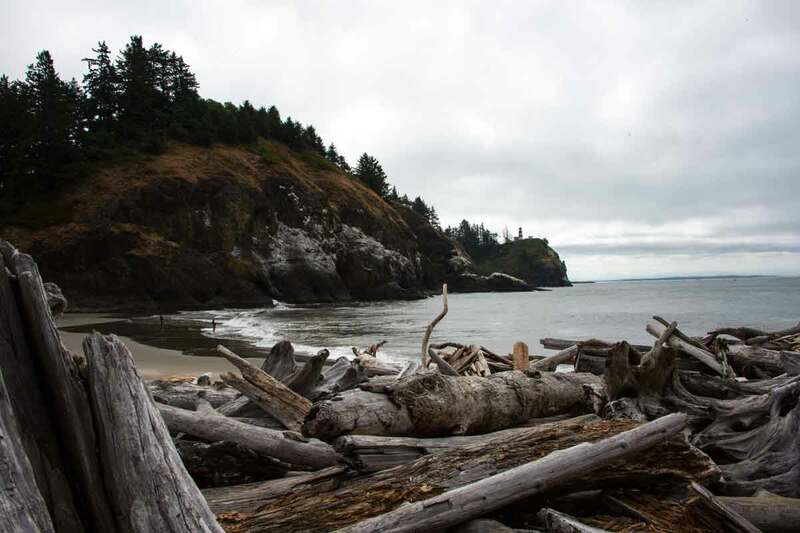 This beach is inside the State Park and a real gem. 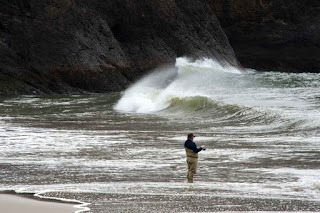 Crashing waves were all around the fishermen ... remember it was Sport Salmon Fishing season. They didn't catch anything. 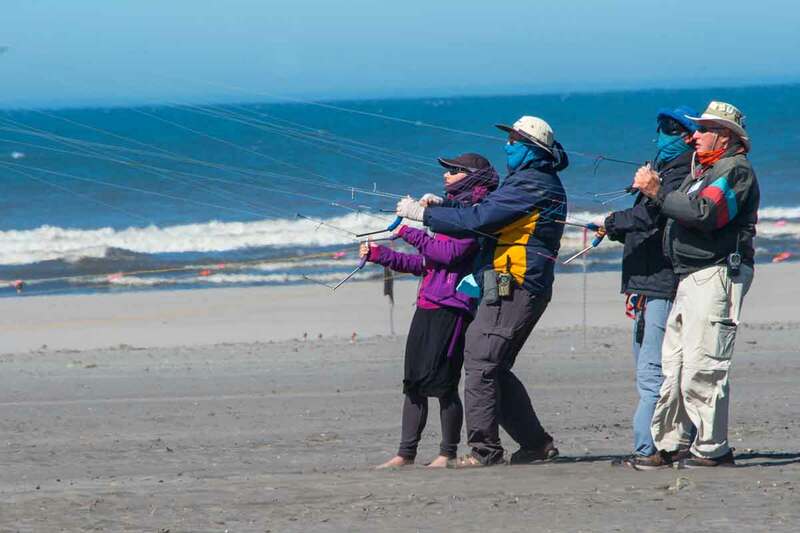 If they had continued further out the road, which is actually the North Jetty, they would have been in the middle of the boats frantically trying to catch their limit. There's lots of parking and great views. 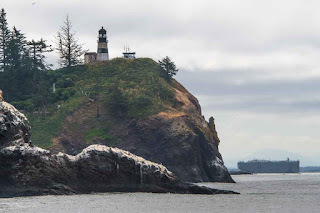 At the furthest natural outcropping is Cape Disappointment. That's a big ship on the right, passing through the deep channel. If you spend any time on the Jetty, you will see this going on. The small boat has just deposited the Bar Pilot on this ship as it came in to the deep channel. 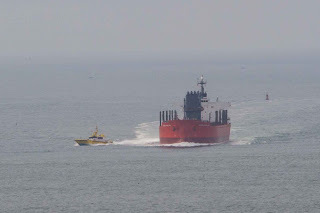 The ship on the right had to stop mid stream and wait for the red one to pass by before heading on his way out to sea. You can barely see the tiny Bar Pilot Boat heading back to the dock. Once the Bar Pilot has the shipped anchored out near Astoria, the Pilot Boat returns to pick him up. Because they know exactly where the sand bars are, the Bar Pilots bring every ship into the river. 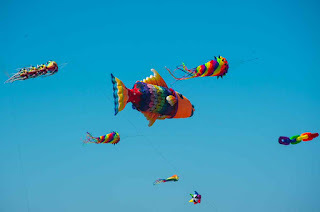 I kept my promise ... no kite pictures!! Temperatures were in the 80's in Tillamook, rather HOT by recent standards, but later overcast skies kept it bearable. I spent most of the day doing laundry since I had a sewer connection. If you're an Elk traveling through this area, you've got double the chance to get a parking space. That's my rig on the left, parked in the pull through row. There are now five huge new spaces behind me and ten more soon to be completed. I have to say AT&T cell and internet service here is getting worse over time however. Moving on, I'll be in Newport, then on to Florence where I have an appointment with an ophthalmologist for an eye problem. I hope it's not bad news, since I'm still waiting on tires. I really need to get them mounted on the rig and have some repairs done at Elite RV before finally heading home. 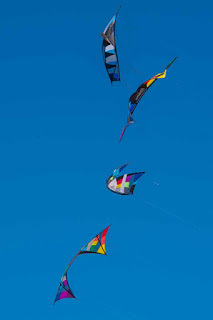 I promise ... other than maybe one or two ... this is the end of the kite pictures. I arrived early on Sunday morning to my appointed station to find the tide had come all the way up and deposited flotsam and jetsam in my tent. I turned the table upright and grabbed a chair. I had a long time to wait. Seems everyone slept in today except me. At 9:00 people started wandering by getting ready for the memorial fly. If you haven't been to one, put it on your bucket list. 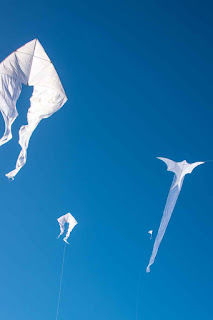 All the kites flown are white and it was amazing. 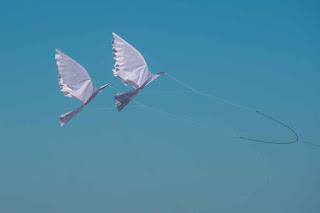 There were all shapes and sizes, including these two dove that flew side by side. 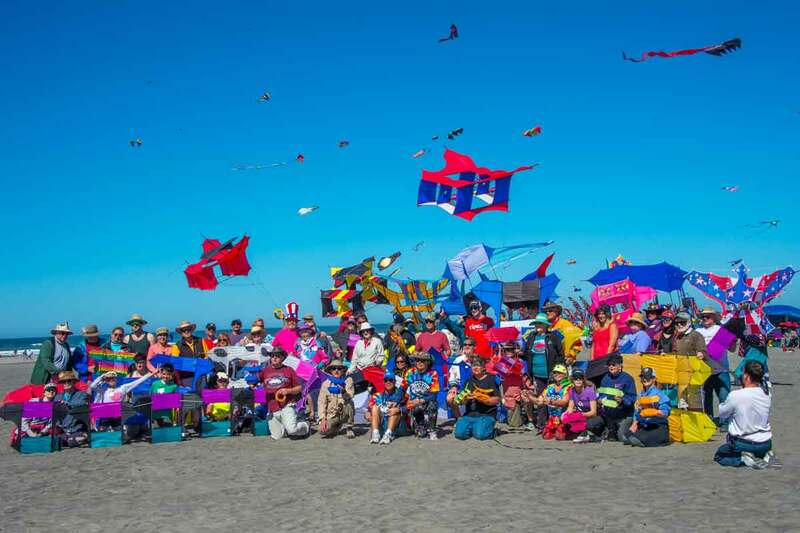 For the most part, this is a kite flyer affair, paying their respects to flyers who have passed in the last year. This kite is made especially for that purpose. The names are printed on the sail and it is raised higher and higher until they let go and it disappears into the sky. 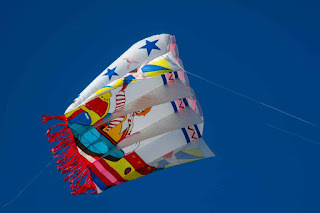 The thought is that when it comes back down, maybe someone will find it and become a kite flyer with their newly found kite. 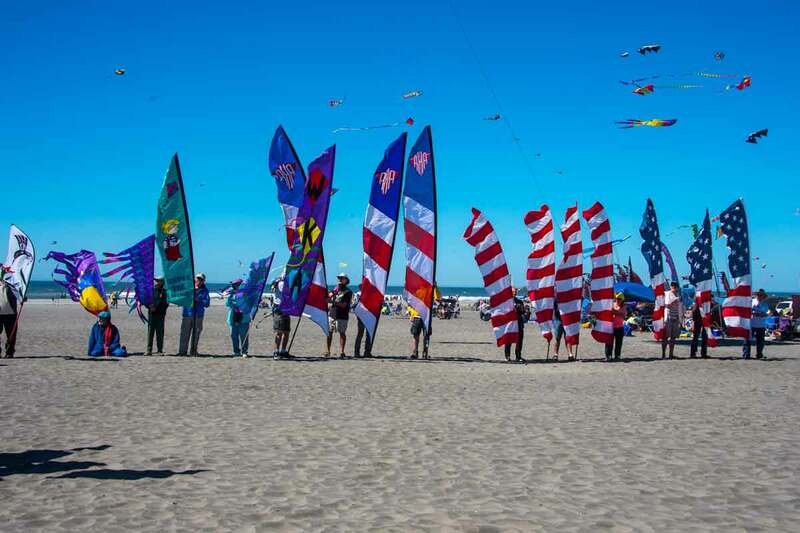 With the ceremonies complete and the cancellation of Revolution Kites Master Competition ... I've no idea why ... it was demo time. 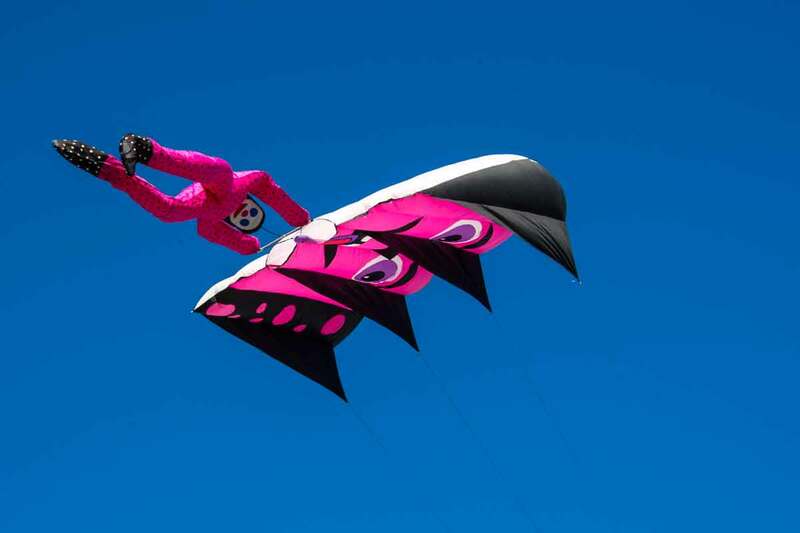 Anyone wanting to give a demonstration of their skills to the crowd could fly to their music. This is Cardin. He was about 3 feet tall when I met him two years ago. We were both beginning flyers taking lessons from John Barresi. Too bad I didn't improve as much as this kid. Since then, I've become good friends with his parents and brother Dylan, who flies just as well. Mom makes them wear rubber boots so she doesn't have to deal with the sand!! He's flying a Vicky. Little fabric, lots of support ... sort of like Victoria's Secret, which is where it got it's name. It lets all the wind go through the kite. Otherwise, Cardin would be flying off like the Memorial Kite. This is Spencer Watson. He's up there with the John Barresi kind of flyers. Yup ... that's the kite he's flying right in front of him, upside down and backwards. Weird, right? It's called a dog stake. 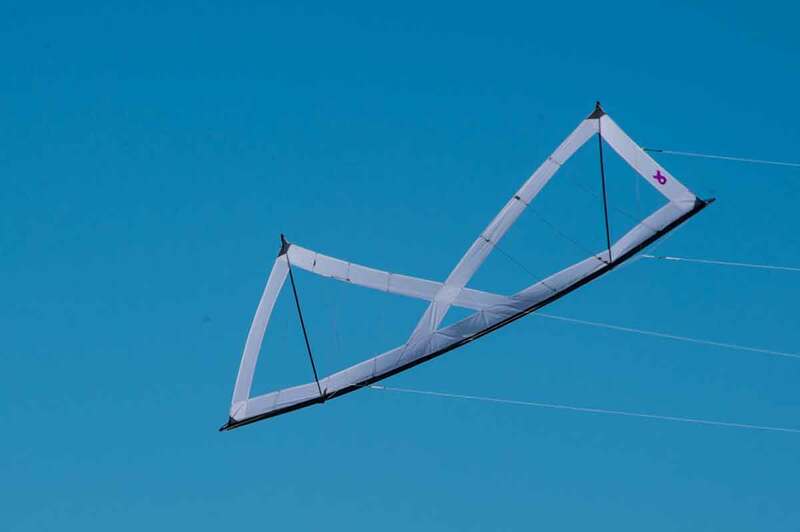 The four lines of his Revolution kite are run through this contraption and back to where he stands. This makes every line work backwards. I can hardly do stunts with my lines working the RIGHT way. Doing everything backwards? No way!! 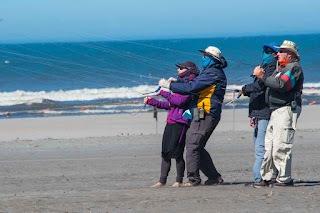 Kite people are amazingly friendly. Just ask anyone how to do something and they will gladly show you. I'm just too shy to ask. When I saw him doing tricks like this before the show (and saw him walking my direction) I screwed up all my courage and asked if he could tell me how to make my kite rotate around the logo. In other words, turn a perfect circle. Little did I know who I was asking. It's called a bicycle, since that's what your hands look like when you're flying. He was so kind to take ten minutes and show me. It was later I found out who he was. Good grief ... couldn't I have picked on a lessor known celebrity??? He's one of the top Rev flyers in the world!! His demonstration was amazing to say the least, and pretty crazy as the music and song (if you could call it that) was about walking in the forest and coming face to face with a killer, then fighting him off. 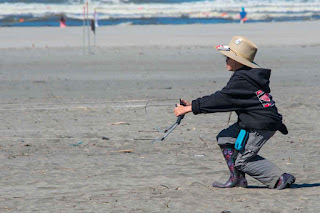 You'd just have to be there to appreciate what Spencer was able to do with that dog stake and his kite. Next up were several groups. I know Joanna will be familiar with these guys. (I wish she had been here to tell me who Spencer was so I would have kept my mouth shut!!) Katrina on the left is calling the "moves" they perform, along with Wayne, Chuck and Dylan, standing in for Mario who had to leave. I mean really ... here's a ten year old flying with the pros!! I'm thinking everyone got new kites this year. 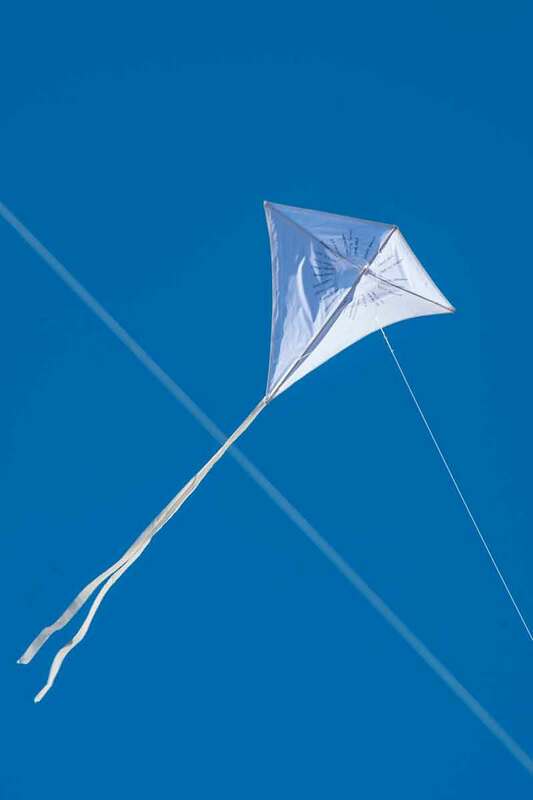 You get to know who flies what, so even if you see them on the ground, you know who's kite it is. 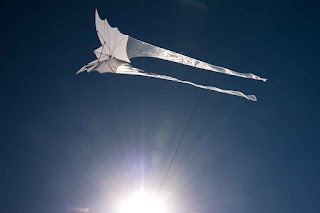 Katrina's husband also flies big kites. I couldn't pass up these ground stakes. They are just too cute. This one flew during the soft kite mass ascension. The tail looks like a guy hanging on for dear life. With the wind getting worse and worse ... probably up to 25 mph on Sunday ... I began to contemplate what was holding my tent down since the sides were moving furniture around inside. Just the same, I held my post until noon. Time to depart and get some flying in myself. 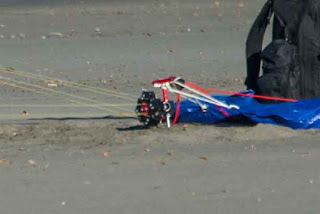 Or not ... since half a mile down the beach where I fly, there wasn't any wind at all by 2:00. WHAT? ?That's crazy!! 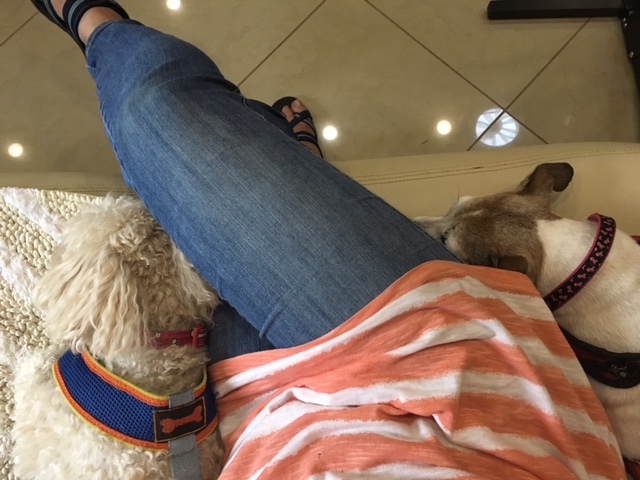 So I hung out with the puppies in between getting ready to hit the road. Surprise!! I'm in Tillamook. When I arrived, there was one space available. I snatched it up. 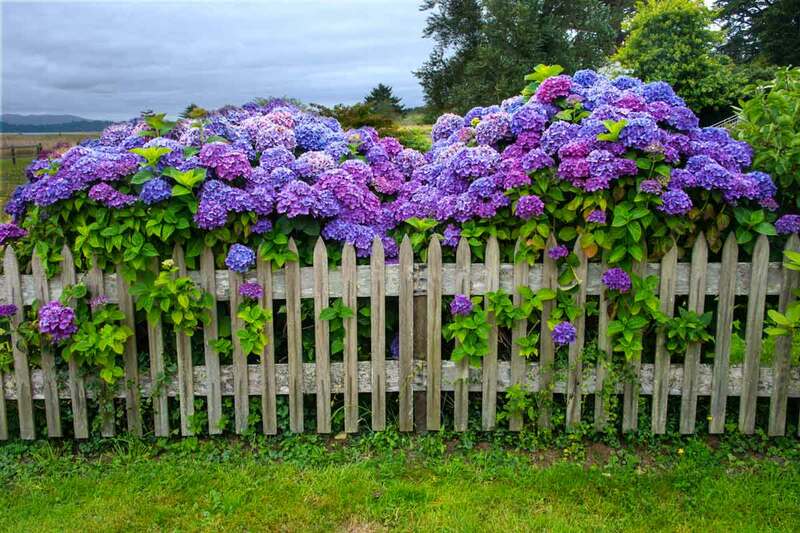 I stepped outside and breathed in the fresh air. Oh YEAH!! This is Tillamook alright. 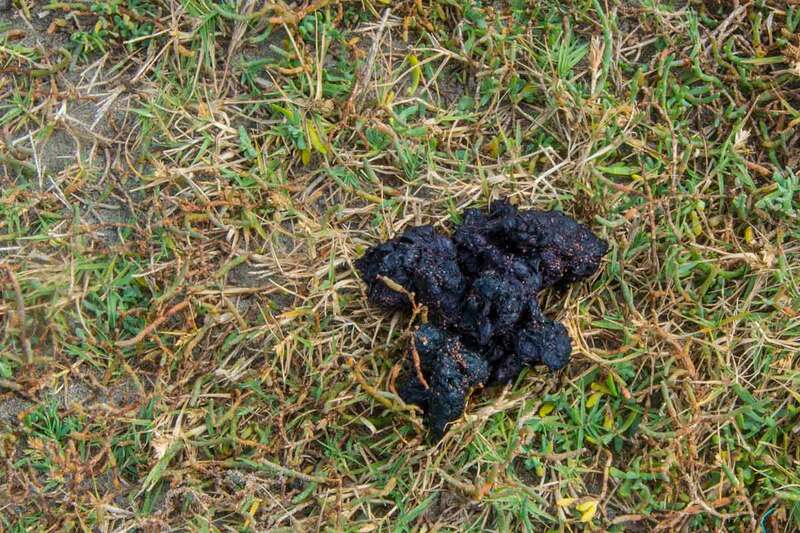 The lovely fresh scent of cow manure!! It's a bad smell to some, but not to me. I guess you have to have been raised on a ranch to appreciate it. In the next hour, 14 rigs left. I think they were trying to tell me something. Before I could fix lunch, 15 more took their place. They are building 15 new spaces here, 5 of which are now complete and can be used for those Elks who want to stay. There's no grass, but everything else is up and running. I'm only here for a couple of nights. I've been trying to get new tires ordered, coordinating it with my stay in Florence and Newport. So far that's not going so well. I have no idea where I'll be, but I'll be somewhere. 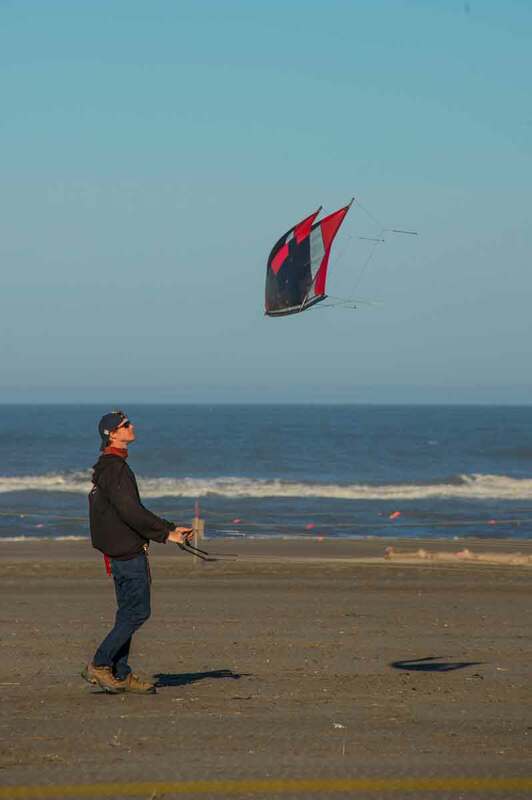 Hopefully getting in a little more kite time. 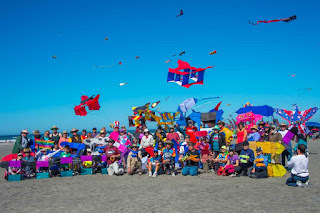 Okay, I wasn't quite right when I said there was one more day of kites. Actually, there's TWO. The most popular activity of the entire week was the Bear Drop on Saturday. Just bring your kids, 9 years and under, to register for a lottery drawing. On this day, 17 bears looking for good homes, were dropped from the Ronald McDonald kite. Least I THINK that was Ronald. You don't want to get between kids and their bears, so I stayed outside the boundary. 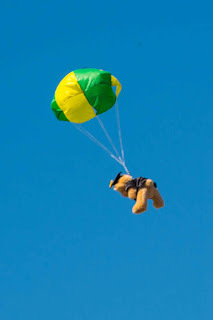 Each bear with a parachute attached went up the line, where on the count of three, they were dropped. 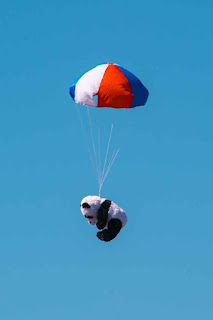 The parachute opened and the lucky kid whose name was called, ran to the landing point. Let me tell you there were some excited kids. I've never seen so many bear hugs!! Unfortunately, those whose names were NOT called, weren't too happy. The Fairy Godmother on call handed out beads and chatchkeys instead. 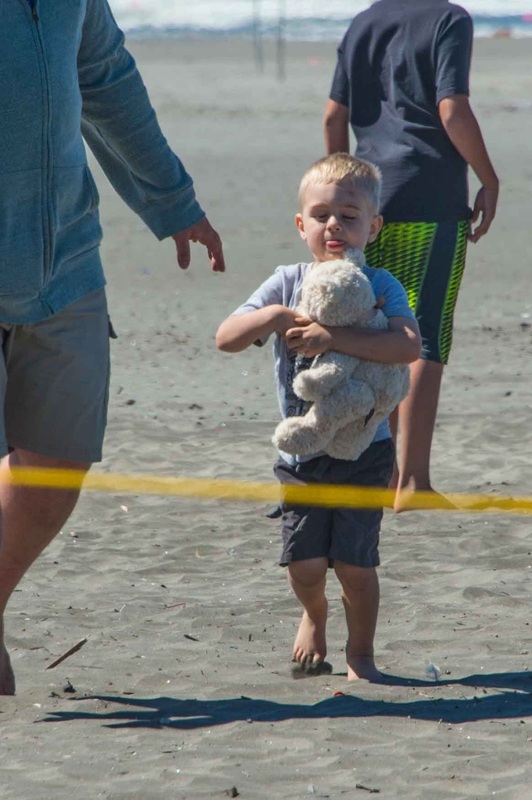 This little boy asked his dad to take him to my tent so he could say thank you in person. How cool was that?? He was so excited, saying this was the first bear he ever had in his life!! Makes you want to cry ... really, it was all the sand from the 25 mph winds sandblasting everything on the field, including my legs and feet!! Then there were those who just didn't care. Don't you wish you didn't mind getting sand in every nook and cranny, not to mention all the dirt?? I'm guessing he was on the ground because the sand was very warm from the sun. 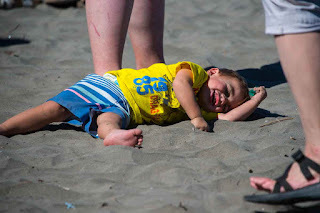 Although he looks like he was crying, he wasn't ... just sifting sand over and over with his fingers. Next up ... the Cody Fly. 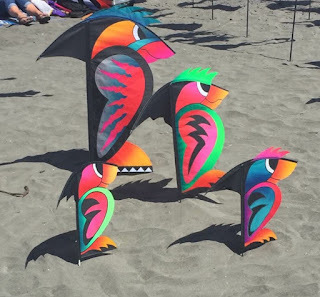 These kites were originally designed by Samuel Franklin Cody, not to be confused with Wild Bill. 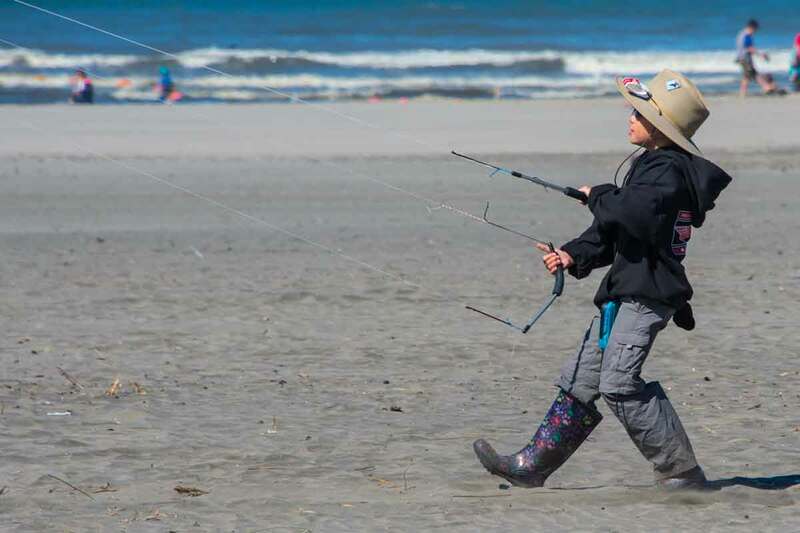 His fascination with kites evolved into using them to lift heavy weights. 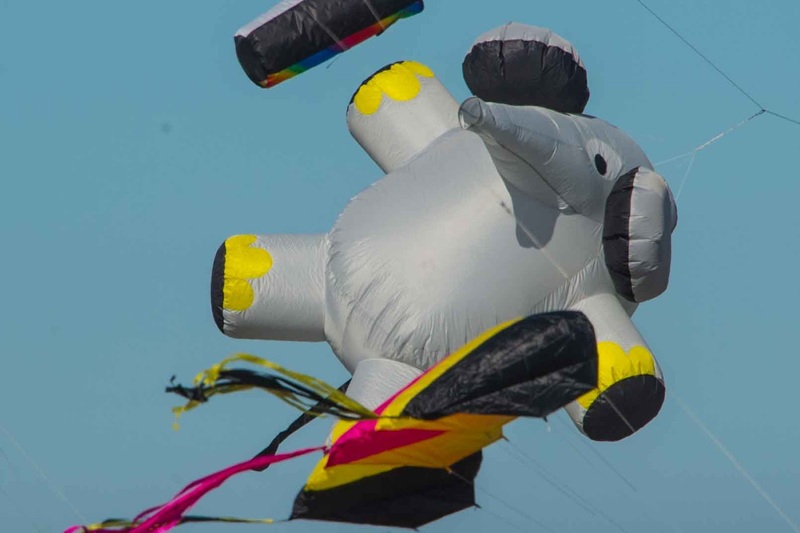 Balloons used for military observation, could NOT be used in strong winds. 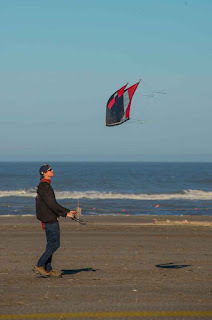 Cody kites could. 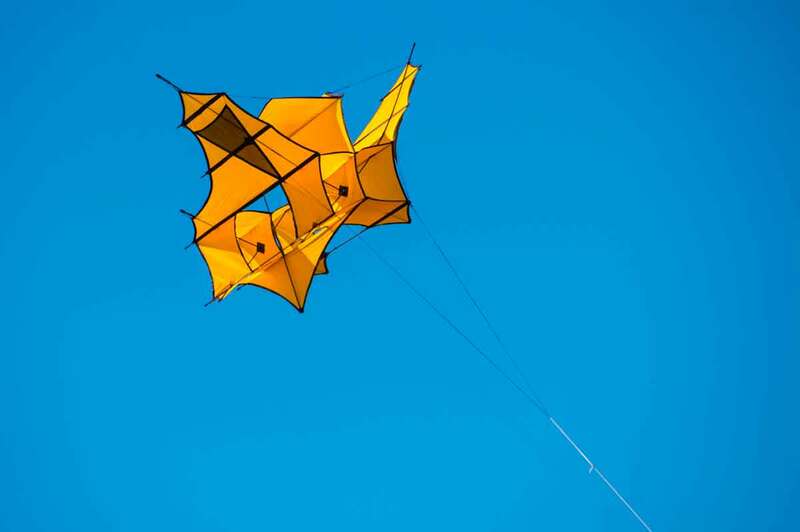 Eventually, the British Army took interest and they were used during World War I (I think) becoming known as Cody War Kites. 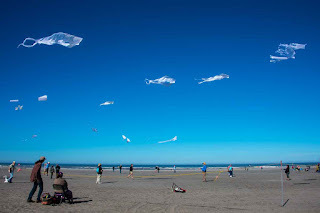 Check out the kite museum for all the info on how these kites were attached to ships. There were a LOT of them at the kite festival. They had a mass ascension, then posed for a picture. I don't think any of these were big enough to carry a man aloft. Some were only six inches long. 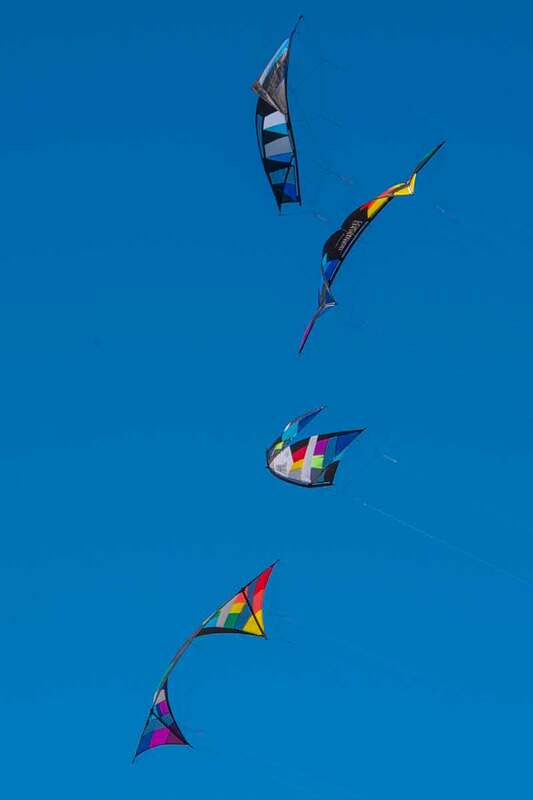 It's always interesting to people watch at the kite festival. I like to doggy watch. Wasn't I surprised when I spotted this kangaroo!! 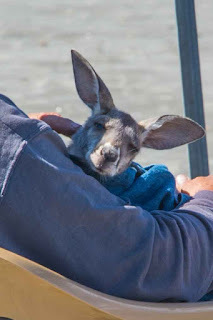 He LOVES to be scratched, and is still a tad young, spending most of his time in the "pouch" hung around this guys neck. More fish flying around, along with a few bugs here and there. The variety of kites is amazing. 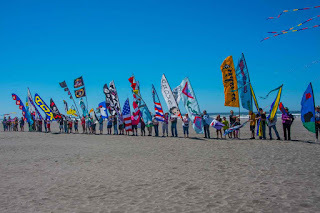 At the end of the day, totally wind burned and beat up, I hit the field to photograph the flag parade. 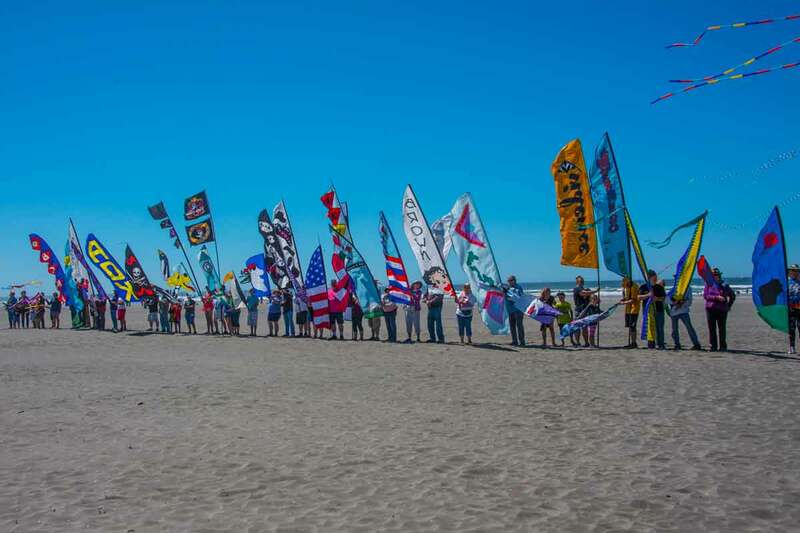 They were having a pretty hard time holding the flags up in the hurricane like winds. I love the American Flag made up of flags. 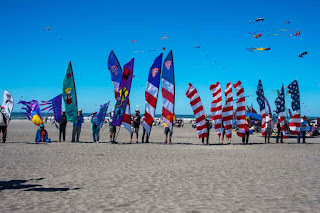 Then there was a mass ascension of soft kites ... those with no spars or rods. The field was jam packed making for tangled lines here and there. 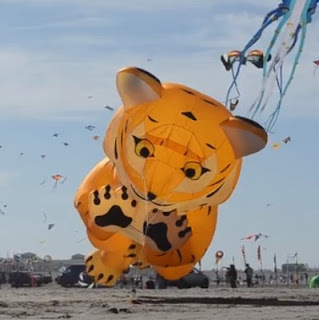 This tiger is a BIG kite. Probably bigger than my RV. There's just no end to the shapes and sizes!! Sunday was a half day. It's a good thing, because I don't think I could take another day of big wind. Well ..... yes I could, because it was just as windy on Sunday for the Memorial Fly as it was on Saturday ... maybe even worse!! But that's tomorrow's story!! WSIKF Day 5 ... I think!! Look!!! Up In The Sky!!! It's All About The Food! !